← What’s a clearcut and what’s not a clearcut in Nova Scotia? 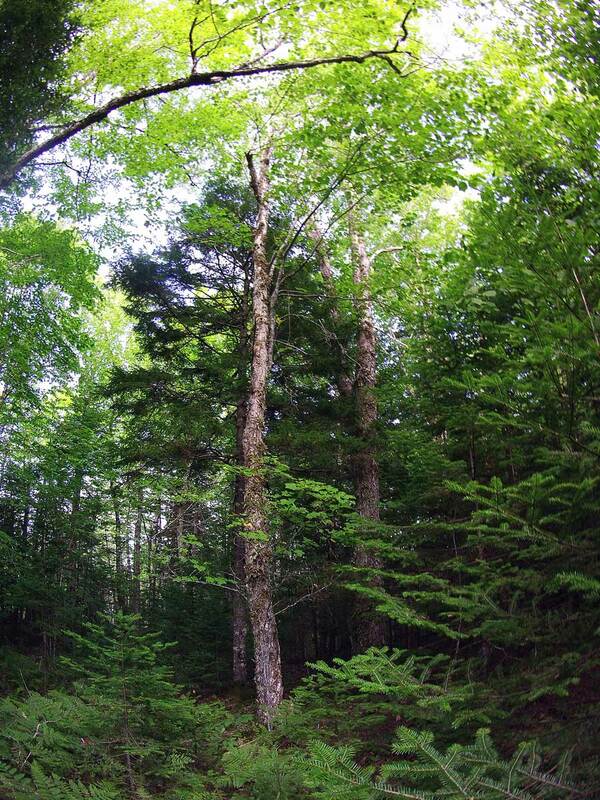 How much mixed Acadian Forest, as on this private woodlot, is in our future? Infrequent and/or gap disturbance regimes are dominant on 51% of the landbase and develop forest associations typical of the Acadian Forest. These forests of red spruce, hemlock, white pine, sugar maple, beech, and yellow birch originate or establish from successional processes started by an infrequent or rare stand initiating disturbance. They are maintained as uneven-aged forests by gap disturbances in the canopy until the next stand initiating disturbance. SOURCE: – Mapping Nova Scotia’s Natural Disturbance Regimes. Frequent disturbance regimes are dominant on 43% of the landbase and develop forest associations of balsam fir, black spruce, white spruce, jack pine, red pine, white pine, white birch, and red maple. Whether due to edaphic site conditions or disturbances (fire, insects, wind) these forests are predominantly even-aged and unlikely to succeed to longer-lived late successional associations of the Acadian Forest. 1.1.5 Extensive forest lands will be managed for resource production using techniques that mimic natural disturbances and sustain natural ecosystem structure and function. Management strategies will be based on the provincial Forest Ecosystem Classification (FEC). 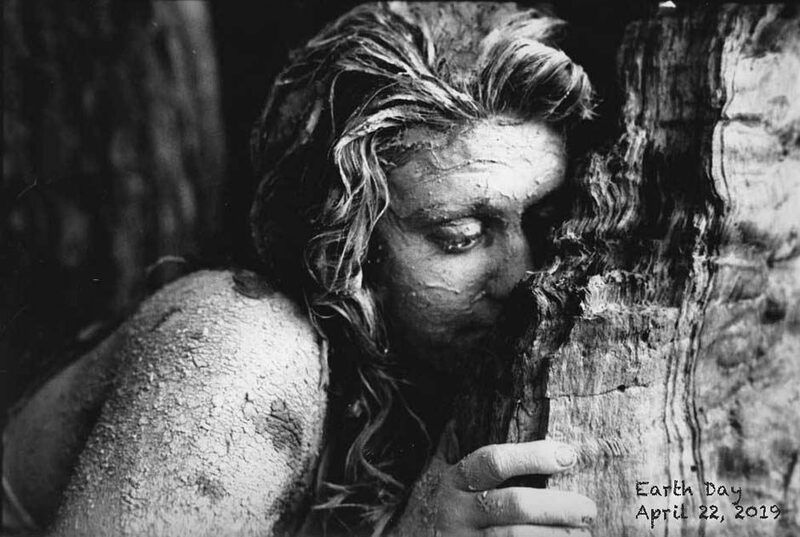 …we should expect that 51% of all harvests are selection harvests designed to maintain mixed, multi-aged Acadian forest and 43% are some form of clearcut designed to maintain even-aged, conifer-dominated stands. So what are the actual percentages? As cited in an earlier post, NFD figures indicate that in 2014, 85.8% of all harvests on Crown land and 88.1% of all harvest in the Province were Clearcut (even-aged management), so twice the level of the corresponding natural disturbance regime according to NSDNR’s figures. So… in 2014, selection harvests were 8.3% of all harvests on Crown land and 7.25% of all harvests for the Province as a whole, i.e. less than 1/5th of the 51% of the landbase that NSDNR says naturally support Infrequent and/or gap disturbance regimes. 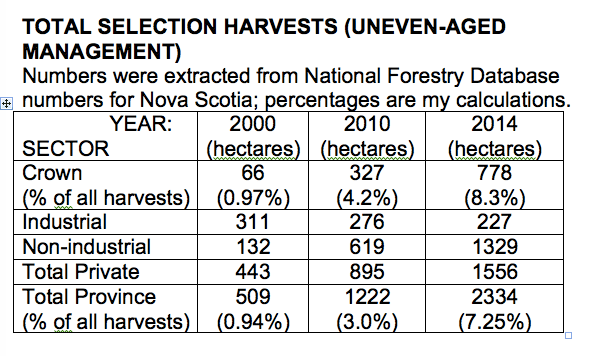 NSDNR rarely refers to selection harvests in its PR, instead referring to Partial Harvests amongst which selection harvests are currently a minor component; or citing the increase in “non-clearcut” harvests but failing to note that most of these “non-clearcut” harvests are conducted within the context of even-aged management regimes. That’s where the “50%” figure came from; it is not “an arbitrary number, with no solid supporting data” as one writer to the CH suggested. Rather it corresponds to NSDNR’s estimate that “Infrequent and/or gap disturbance regimes are dominant on 51% of the landbase”, and the way to manage those lands accordingly is clearly selection harvests, NOT clearcut or “Partial Harvests” conducted in the context of even-aged management. Evidently, this is not happening. Unfortunately, the story doesn’t end there. NSDNR’s estimate that “Frequent disturbance regimes are dominant on 43% of the landbase“ is highly questionable, with most estimates of that proportion being much less, and estimates of the proportion of Infrequent disturbance regimes, much higher. But leaving that aside, how can NSDNR continue to say that it is following the Code of Forest Practice when even based on its own numbers for the occurrence of Frequent and Infrequent Disturbance Regimes, it is way off base? Perhaps I have completely mis-interpreted the numbers. Perhaps there are alternative explanations for the numbers. They examined 34 selection harvest sites randomly chosen from selection harvest operations 2004-2006, 1705 ha in total. It is a very thorough study. A couple of points I found particularly interesting: the growth over the 8 year post-harvest period indicated that ‘it will take 27 years for the volume to grow back to pre-harvest levels”. Of interest to me because an elder from the Parrsboro area told me that on his dad’s mixed woodlot, they cut at about 30-year intervals (pre-1960s). Yellow birch and red spruce – 2 mainstays of the Acadian forest – responded particularly well to selection cutting, sugar maple moderately, and red maple did not respond to release from selection harvest.. all of which seems to make sense ecologically. The study provides a very good basis for moving quickly to increase the amount of selection cutting. I was particularly pleased to see the statement that selection harvesting must be increased to meet the goal of ecosystem-based management … quite a different perspective from the more public, oft-repeated PR statements coming out of NSDNR that “all harvest treatments are aligned with the nature-based requirements of Nova Scotia’s lands”! More honesty at the PR level would raise, not lower, NSDNR’s (and the Government’s) credibility. This blog post is the 3rd of three in a series that explore the apparent contradiction between public concern about clearcutting in Nova Scotia and NSDNR reassurances that clearcutting has been reduced and that “all harvest treatments are aligned with the nature-based requirements of Nova Scotia’s lands”. This entry was posted in Acadian Forest, clearcuts, Conservation, NSDNR, Selection Harvest, Show Us the Science. Bookmark the permalink.